Your trial period has now expired. We hope you found the site useful. If you are interested in subscribing, or have any questions about the database, please email thebankerdatabase@ft.com or call us on +44 (0)207 775 6370. You have clicked on content or functionality that is only available to subscribers. 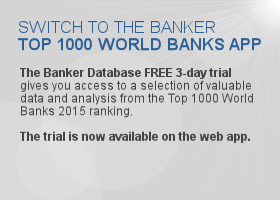 The Banker Database tracks the leading banks in every country, over 5000 banks and 82 financial data points and 27 non-financial data points. Please contact me to schedule a demo. My preferred dates/times are: (optional).